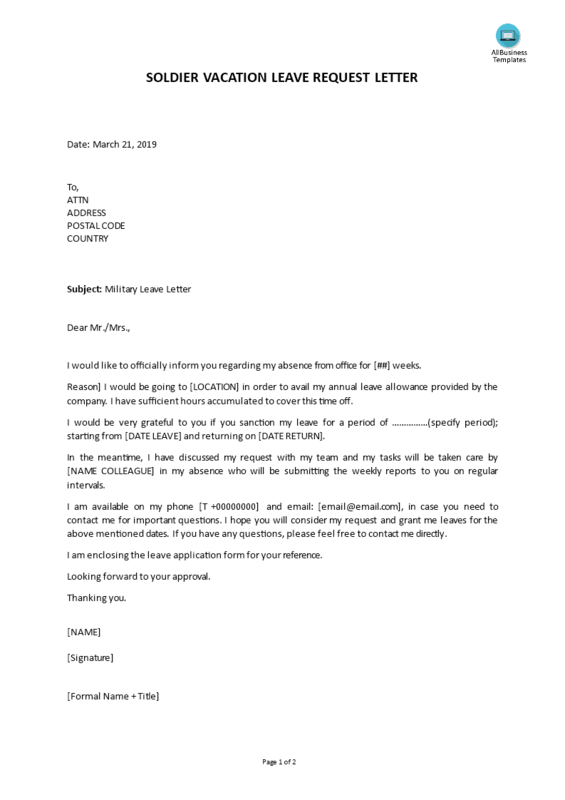 This ready-made and easy-to-customize a blank Soldier Leave letter template is well suited for any kind of personalized business matter. Communicating in a professional way will get you respect and will bring you further in life. Using this Soldier Leave Letter provides you with a perfect example letter template that you can finish within minutes, so you will have more time to focus on other, more important things. Reason] I would be going to [LOCATION] in order to avail my annual leave allowance provided by the company. I have sufficient hours accumulated to cover this time off. I would be very grateful to you if you sanction my leave for a period of ……………(specify period); starting from [DATE LEAVE] and returning on [DATE RETURN]. Please note this template is provided for guidance only. Download this Soldier vacation leave letter template to write a perfect (and personalized) letter, edited to fit your personal situation. If this letter does not fit your requirements, please also have a look at the topic: Leave Letter Templates.